Arclight is a story of a world where light is coveted and darkness is dangerous. In the first pages, we meet Marina and her classmates in a middle of a lesson. However, what starts out as any other night quickly takes a turn for the worst. The Fade have invaded the sanctuary that human society has built, and Marina seems to be right in the middle of it. Marina must figure out the secrets behind the teachings she grew up with and discover for herself what the Fade is all about. Guys, I seriously enjoyed this book. Honestly, going into it I wasn’t sure how I would feel about it. But once I started reading, I couldn’t stop. Marina is an interesting character. She has a lot to deal with and I think she deals with it pretty well. The circumstances that surround this girl are less then pleasant, yet she continues to fight for the truth. The fact that she seems to be the only person to ever survive the Fade puts her into an uncomfortable position. The others don’t exactly accept her, and that includes Tobin. In the beginning, Tobin seems to dislike Marina quite a bit. That’s what Marina tells us. And he does have a good reason for it being so. However, everything changes when the Fade invade. Tobin and Marina start off on rocky ground, but I really enjoyed watching their relationship develop. I love the romantic side to Tobin, the little things he does to bring a smile to Marina’s face when everything seems to be going sour. I liked this kid a lot, people. A lot. Overall, this book is one thrill ride. Once you get into the story, it doesn’t want to let you out. Sure, I saw the “surprise” developments coming before the characters did, but it didn’t really take away from the story. I enjoyed getting to know these characters and the world they live in. 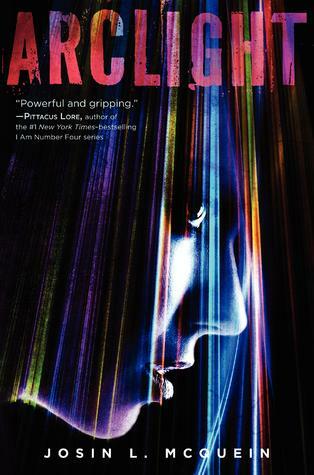 Arclight hits the shelves on April 23, 2013! Go get your copy now!